Saints’ hopes of reaching the top five of Conference C were dented after this heavy defeat to Broxburm. United’s pre-match plans were hindered following injuries to Cunningham and Honeyman. With the top five sides in the division being promoted and creating a new top tier for the East of Scotland League next season, Saints know that picking up as many points from their few remaining games is crucial. On Saturday Saints started up the slope and it was the visitors who immediately pressed forward. Broxburn took the lead when a long ball forward saw Beesley break through the home defence and beat Lee Wilson. Saints tried to play a passing game but repeated interceptions by a ‘Burn created lots of problems. Failure to defend and clear saw Broxburn go two up in 20 minutes through Binnie. The Broxburn front man raced clear on goal and had the simple task of slipping it past Wilson. Saints tried hard to make an impression at the top end but crosses were either too long or the forwards couldn’t make space to get shots on goal. Unfortunately Saints couldn’t hold it at just 2-0 down and conceded a third before the break. With several defenders in attendance trying to clear the ball away, it somehow broke to Beesley and he hit it from close in to the far corner. Shortly after half time Saints lost a fourth. It was the final nail and came from a corner which was hit to the back post and, sadly for Quinn, he headed it perfectly into the far corner of the net while trying to clear. Despite defending for the rest of the second half, the visitors retained control of the game. 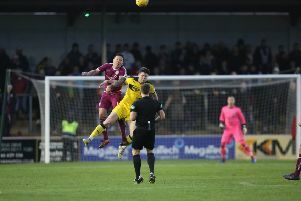 Saints were unlucky on 56 minutes when a glanced header from Stark looked netbound, but keeper Wallace got fingers to it and tipped it past post. An effort from Penman six minutes later was deflected over keeper Wallace but, with another good save, he managed to get back to tip it over the bar. Substitute Jack Wilson tried to get a shot away with 25 minutes left but it was poorly hit. With quarter of an hour to go Lee Wilson pulled off an excellent save from another break by Broxburn. A final chance fell Saints but their corner wasn’t good enough and broke to a Broxburn player who cleared. Saints remaining fixtures: March 23 Preston Athletic (h); March 30 Ormiston (h); April 13 at home Linlithgow Rose (h). Saints: L Wilson, M Fleming, O Fleming (A McDonald72), Rendall, McInnes, Falconer (J Wilson 62), Penman, Stark, Quinn, S Macdonald, McManus (DFleming 82). Subs not used: Blaney, Moran.